Photos courtesy of Yawata Works, Nippon Steel & Sumitomo Metal Corporation *Privately-held facility not open to the public. *Reproduction of photographs is prohibited. This is the first main office built in 1899, two years before the establishment of the Yawata Works. It is a red brick structure with a dome in the center and is bilaterally symmetrical. It housed a director’s office, chief engineer’s room, offices for foreign consultants and engineers, and other facilities. Along with the expansion of the iron and steel works in 1922, its administrative function was moved elsewhere, and it was used for other purposes, such as a research center for iron and steel and as an inspection facility. This is the oldest steel frame structure existing in Japan today, and it was built in 1900 using designs and steel materials by Gutehoffnungshütte (GHH) of Germany for the purpose of repairing machinery used at the iron and steel works, as well as for fabricating and machining parts for them. After that, it was expanded three times in conjunction with the increase in the production volume of steel materials. It has been functioning as a repair shop for over 110 years and is still in operation today. This is a steel frame building constructed using designs and steel materials from GHH in Germany, same as the Repair Shop. Its purpose was to manufacture the forging products required in the construction of the iron and steel works. As the iron and steel works projects increased, it was also expanded, but afterward, in 1917 it was dismantled and reconstructed in its current location to be used for product testing. Currently, it is used as an archive for iron and steel works, but it is not open to the public. It supported the coal industry in the Meiji, Taisho, and Showa Periods with its abundand deposits of high quality coal. 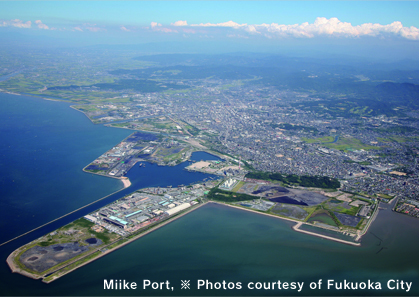 The port was constructed to be able to load directly Miike Coal onto large ships for transport. The work started in 1902 and ended in 1908. At the same time, it was designated a treaty port, and it operated as a trade port for the transport of Miike Coal to Shanghai, Hong Kong, and other locations. Before the port construction, it was used to transfer coal from Ohmuta City to Kuchinotsu Port (currently Minami-Shimabara City, Nagasaki Prefecture) and the former port of Misumi West using small boats. The coal was then reloaded onto large ships and taken overseas. Docks were strategically placed and contained weirs to retain water at a specific level at the long sand shelter dikes because they faced the Ariake Sea with its widely varying tides. It still functions today as an important port. 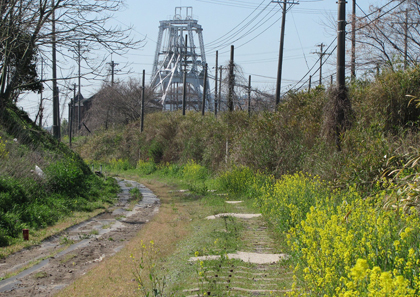 The Miike Coal Mine was developed employing Western coal mining technology after it was used in the Takashima Coal Mine. The mine boasted ample deposits of high quality coal and responded to the domestic demand for coal. The Miyanohara Shaft was the mine’s main minethead during the Meiji Period to the beginning of the Showa Period and was the first one mined after the sale to Mitsui. The second shaft and winding tower still exist today. 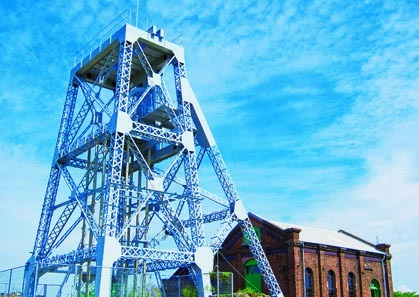 Work on the first shaft started in 1895 and finished in 1898, after which mining operations began. The second shaft was constructed between 1899 and 1901, and then became operational. In 1930, when notifications were sent out that the practice of using convicts to work in the mining shafts in Japan was abolished, the following year a decision was made to shut down the Miike Shujikan (then Miike Prison). As the main source of labor for the Miyanohara Shaft was prisoners, it was closed in 1931. However, the water discharge functions for the shaft were maintained, and the scaffolding and winding tower continued to function even after the Miike Coal Mine was closed (1997), up until the second shaft was shut down in 2000. 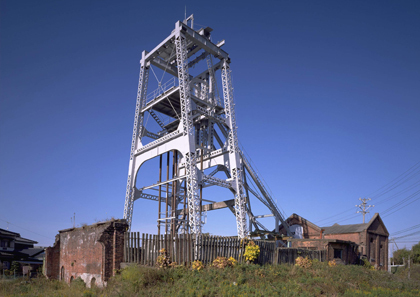 The Manda Shaft is one of the mineheads of the Miike Coal Mine. It was sunk about 1.5 km to the south of the Miyanohara Shaft and the mining company invested all its resources to maintain it as a model example of coal mining in Japan at that time. It is composed of the first sub-shaft that was dug starting in 1897 and finishing in 1902, and the second sub-shaft which was completed in 1908. They boasted the prestige of being the largest shafts in Japan at that time, and were maintained from the Taisho Period to the beginning of the Showa Period. Equipment and machinery were augmented and the output of the mine expanded. However, as the coal mining region became more isolated starting around 1845, transporting the coal from inside the mine grew increasingly inefficient and mining was shut down in 1951. After that, the mine continued to pump the water inside the shafts and managed the tunnels up until the closure of the Mitsui Miike Coal Mine in March 1997. Today, facilities associated with the No. 2 Shaft remain in good condition. The Miike Coal Mine Private Railroad was a railroad maintained exclusively for freight, transporting coal extracted from the various shafts of the Miike Coal Mine to ports and national railroad lines. It linked the Miyanohara Shaft and other shafts in Ohmuta City to Miike Port through the Manda Shaft in Arao City, and connected the Miike Coal Mine and a group of related factories like a grid. At one time during its heyday, it stretched 150 km including its branch lines, and was utilized in later years to transport workers to and from the mines. When the mine was shut down in 1997, the rails were removed, but the remains of the platforms used at the time are still in good condition. Today, the essential utilities, steel towers, piping (for electricity, water, and gas) have been installed as essential utilities and the lifelines for the region, replacing the coal mine train. In addition, since the railroad was meant to transport large quantities of coal and other heavy freight, the track bed for the railroad was laid so there were no slopes or hills along its course. This meant it had to be cut through hills and mountains, and embankments had to be filled in to keep the tracks running level, and this all remains. Today, the shape and form of the country´s only railroad which carried coal from mines to the ports still lives on today as a wonderful reflection of the coal mining landscape. Repeated trial and error brought us closer to industrialization. Copyright © Nakama City. All rights reserved.